Portland officials and volunteers take the planned Naito protected biking-walking path out for a spin. The full test begins Friday and will continue for two weeks. Forty-one years after Portland completed one of the country’s first highway-to-park conversions, the riverside park it created is overflowing with activity — and the city is experimenting with the next step. 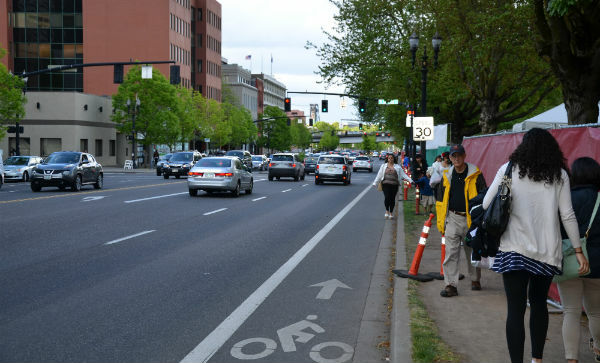 For two weeks starting this Friday, the city will convert one travel lane of Naito Parkway alongside Tom McCall Waterfront Park to a physically separated multi-use path for people biking and walking. Today, the park spends much of the summer hosting festivals. But each year that leads to problems: extreme walking-biking congestion in the park’s existing riverside path, and also people walking and pushing strollers in Naito’s painted bike lane on the other side of the park because there’s no other place to walk. That in turn leads to people using Naito’s bike lane veering into traffic. Meanwhile, the nearby northbound lanes on Naito Parkway carry only about 800 cars between Main and Couch streets during each rush hour, far less than would make two northbound auto lanes necessary to prevent congestion. 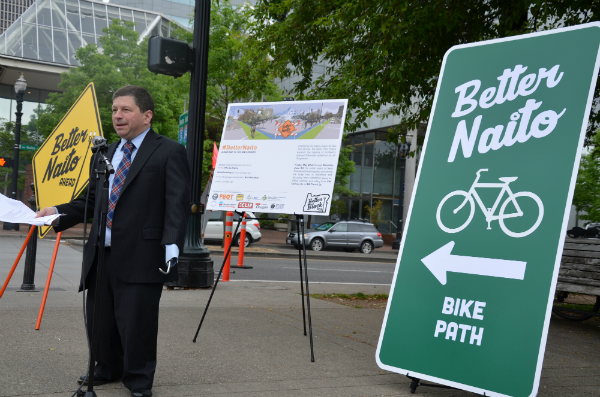 This spring, responding in part to citizen concerns, Portland Transportation Commissioner Steve Novick began looking for a solution to the Naito walking and biking congestion. The community group Better Block PDX, which conducts temporary demonstrations of human-focused public spaces in Portland, had also been thinking about different ways to use Naito and had approached a group of civil engineering students at the nearby Portland State University to create an alternative design for the street. A plan came together rapdily over the last few weeks, culminating in a press conference Tuesday in which Novick announced that the city would partner with Better Block to install a live test of the PSU engineering students’ design. Portland Transportation Commissioner Steve Novick announcing the demo on Tuesday. The demo will continue through June 5. For the final three days, it’ll be extended several blocks further north in order to test the space further as a bidirectional bikeway that would connect a longstanding gap in the city’s biking network. Throughout the demo, the city will use bluetooth sensors to document the impacts on biking, walking and driving traffic. The trial is made possible by Clif Bar, which is sponsoring Better Block PDX’s costs to put on the event through a grant selected by PeopleForBikes. Gwen Shaw, a senior civil engineering student at PSU who worked as part of a team of five on the experimental Naito design, said it was thrilling for her capstone project to be a plan that would actually be implemented before her eyes. None of her cohort’s other capstone projects are similar, she said. “The rest of them are just reports and some documents,” she said. Collaborating with planners to create a live demo is thrilling for an engineer, she said, because she actually got to think creatively rather than solving familiar problems in expected ways.